At least 140 prisoners escaped from a Nuevo Laredo prison today, though that number is believed to be a conservative estimate. Mexican media outlet El Universal reported this morning that the number of escapees could exceed 190. Texas law enforcement agencies have confirmed earlier reports that a massive prison break took place in Nuevo Laredo, Tamaulipas, which sits just across from Laredo, Texas at the southern end of the I-35 corridor. “The law enforcement community is well aware of the situation and they are taking all the necessary precautions to keep a close eye on things. Everything has been passed along to the patrol division,” said Investigator Jose E. Baeza, a Laredo Police Department spokesman. At least 140 prisoners escaped from the prison, Baeza said, though that number is believed to be a conservative estimate. Mexican media outlet El Universal reported this morning that the number of escapees could exceed 190. “We had it confirmed through the [intelligence] community in Laredo. It’s very sporadic with information. Basically we know just very general information,” Baeza said. The outbreak comes the same day the city of Laredo opened its “paisano rest stop,” just outside the city limits. The stop provides thousands of Mexicans returning to Mexico an array of free services that range from minor car repair work, to advice from U.S. and Mexican officials on how best to make the commute through customs. “There is never a good time for a prison outbreak, but this one could not have come at a worse time,” he said. As early as 8 a.m., Baeza said, traffic from Mexicans waiting to get back into Mexico via one of the city’s international bridges stretched from the port to U.S. 59, about 30 city blocks. He said it appeared most, at least, had heeded warnings from the Mexican government to travel in convoys and during the day. The outbreak comes just one day after the Texas Department of Public Safety issued a warning to U.S. citizens urging them to avoid traveling into Mexico during the holidays, citing among other things, an increase in kidnappings of non-Mexican citizens and criminal assaults on Mexican highways. “The safety and security of holiday travelers cannot be guaranteed if they venture into Mexico,” said DPS Director Steve McCraw. 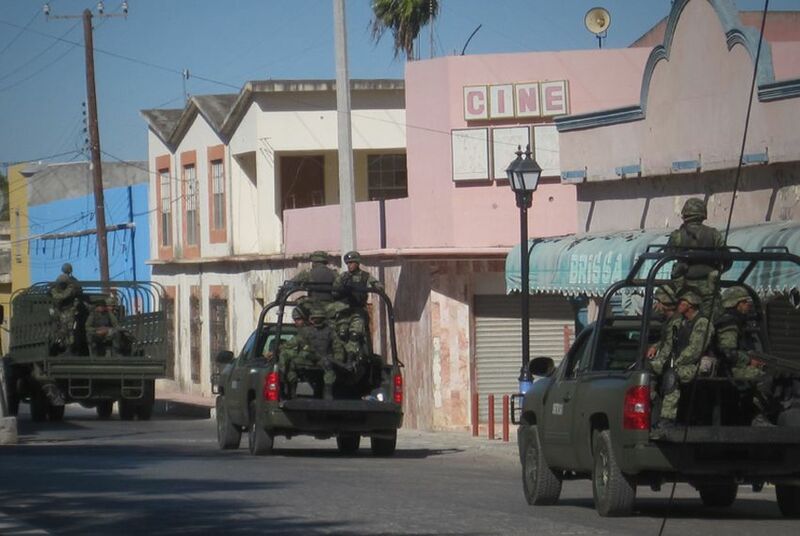 After a few years of relative calm, the city of Nuevo Laredo has witnessed an increase in murders and shootouts this year after a split between the Gulf cartel and its former enforcement arm, Los Zetas. The groups had a secure grip on the smuggling route that extends from there into Texas and beyond after battling their rivals in the Sinaloa cartel last decade. The Gulf and Zetas split in February, which led to ferocious battles for the northern state of Tamaulipas.